Department through Preliminary, Physical tests, Mains Exam. Online submission of application form last date for this Andhra Pradesh SLPRB Police Sub Inspector Preliminary, Mains Exam is 24-11-2018. Online application starts form 05-11-2018. 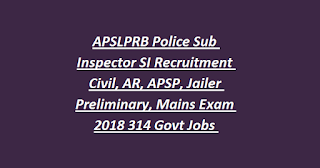 The selection for APSLPRB Police Sub Inspector Recruitment 2018 is will be in three stages. Eligible candidates should apply online for this SI Jobs through APSLPRB official web site @recruitment.appolice.gov.in. Physical fitness tests, Physical measurements tests, eligibility conditions, preliminary test, mains examination details, age limits, exam pattern syllabus, Pay scale and more details regarding APSLPRB Police Sub Inspector Recruitment Exam 2018 Notification please see below information. Download official notification of Andhra Pradesh Police Sub Inspector Recruitment. There are total 314 vacancies available in Andhra Pradesh Police Department Recruitment. The candidate must have qualified Degree from a recognized university. For all candidates' age limits are 21-25 years as on 01-July-2018. For SC/ST/BC candidates 5 years of age relaxation is given. For Assistant Matron Post age limits are 21-25 years. Selection for this Andhra Pradesh Police Sub Inspector recruitment is held in three stages. Preliminary test will be conducted for 200 marks consists of 2 papers. Both the papers will be in objective type multiple choice questions only. Subjective test will be conducted for those who qualify the Physical Standard and Efficiency Test. Mains Exam Pattern for APSLPRB SI Civil, Jailor and Matron Posts. Mains Exam Pattern for APSLPRB SI AR, APSP, SAP CPL Posts. All the male and female candidates have to clear all the three events. For the posts of Police Sub Inspector AR, APSP, SAR CPL merit in timing will be considered for 100 marks. For SC/ST Examination fee is Rs.300/- and for others Rs.600/-. Applicants have to pay the examination fee through online using Meeseva center or TS online or AP online centers or using debit or credit card or net banking. Eligible criteria having physical fit and interested candidates can submit their application forms online @ http://recruitment.appolice.gov.in on or before 24-11-2018. 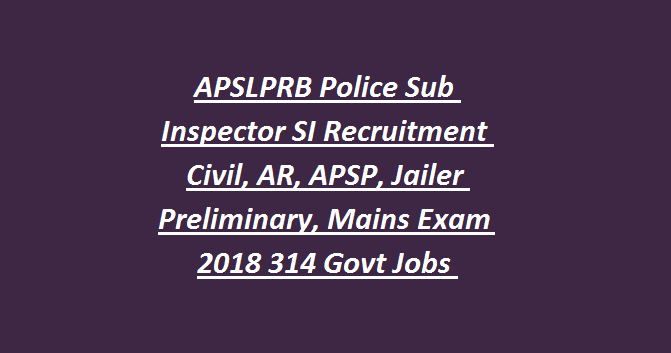 Click here to apply online for the APSLPRB Police Sub Inspector Recruitment 2018. APSLPRB Police Sub Inspector Recruitment 2018 article to your lovable friends through online via social web.